Do you like Caveman Hunt? Share it with your friends. 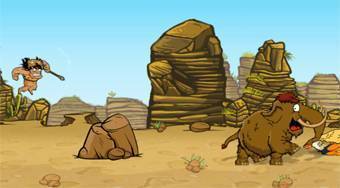 Caveman Hunt is a very catchy perception game in which your task will be to help the Neanderthal catch his tame mammoth that escaped him during his feeding. Shoot the Neanderthal from your sling, reflect with him from the trampolines, birds, rocks and try to fly as far as possible to catch the fugitive mammoth. Get some useful upgrades for your money.